Expressive Elocution was created in response to student's needs in and out of the classroom to read aloud, show and tell, present reports, debate, perform mock trials and interview without any technical preparation. Poor breathing habits, distracting physical gestures, improperly used voices, no sense of vocal messaging, poor articulation, not to mention stage fright, are just some of the obstacles each student has to face. Expressive Elocution's objective is to provide a safe, supportive environment for students to learn how to vocally explore and express themselves in a variety of situations. Through age appropriate games and exercises for both listening skills and vocal production, students learn how to control and maximize specific aspects of their speech such as volume, speed, pitch and resonance. They do exercises to learn how to become objective listeners who can constructively criticize their own work. They will learn how to explore and pronounce sounds to clarify intent through their use in language. Physical awareness, maintaining focus and engaging an audience are also explored. Most importantly, students learn that all their peers go through the same anxiety as they do and that there are specific actions they can take to overcome these feelings and become successful speakers. Expressive Elocution is offered to grades 3 - 12 in weekly forty-five to sixty minute standards-based classroom workshops or residencies. 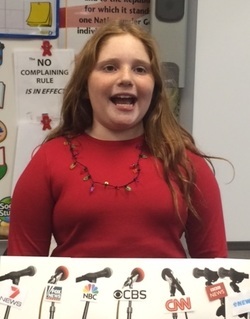 Expressive Elocution gives students the tools to be heard, to be understood and to be confident. Also check *Expressive Elocution for ESL students, *Multicultural Voices and the *STAR After School Program.